The presentation attracted some 1,000 people from the local institutions of science, education, youth organizations and universities to the Macao Tower, a multi-functional conference center. Macao's Secretary for Transportation and Public Works Ao Man Long extended the warmest welcome to the delegation on behalf of the Macao Special Administrative Region (MSAR) government. 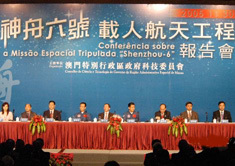 He told the gathering that the accomplishment of the Shenzhou VI mission marked another milestone in the history of the development of China's space technology. The official said the meaningful science publicity carried out by the delegation will also help encourage the Macao people in their way to a more promising future. Xia Changfa, deputy chief designer of China's manned space flight project, informed the audience of the recent developments of China's aero-space technology. Fei Junlong and Nie Haisheng, the two taikonauts aboard Shenzhou VI, presented to the gathering their main training programs and the living and working details in the space. The taikonauts and engineers also answered questions raised by the audience. The 30-strong delegation arrived on Wednesday after concluding a four-day tour in Hong Kong. During their stay, the delegation members are also to meet local students and people from other walks of life, and to attend a grand evening gala, hosted by the MSAR government.